At Kuaka we actively run & manage reforestation sites. Your students see what's involved in returning marginal farmland & once great wetlands to their natural state. They learn & discuss how we use scientific methods to measure the success for such projects & how these monitoring practices could be 'Taken Home'. Healthy environments depend on clean water, on trees & on the resources those trees provide and protect. Protecting land from erosion, on steep hillsides & on river banks, protects water sources & minimises sediments. Planting trees in these vulnerable areas slows the water by creating natural barriers & allows the water to soak into, then filter through the soil. These results can then be measured, both in the growth rates of the trees & by the health of the ecosystems downstream. A further value of planting trees is carbon offsetting. We monitor a specific species biomass to calculate the carbon absorption of our project sites. Against this we are building data on how geography, topography & seasonality effect these results. Trees sequester carbon & offset the environmental impact of travel. Downstream marine health is degraded by sediment in the water. 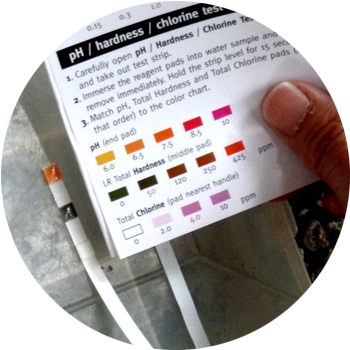 We use indicator species to give a profile on the health of estuaries based on land stability in the overall watershed. Using a species whos food source & environment are incredibly susceptible to damage from sediment, we can track growth habits along a transect line. Water quality is the best indicator of the health & stability of an ecosystem, change is found in the water. We focus on water catchment modelling to highlight the interconnections between the sites we visit. Oxygenated water supports animal life. Our test is a presence / absence survey identifying species & which of those species need an oxygen rich environment to survive. 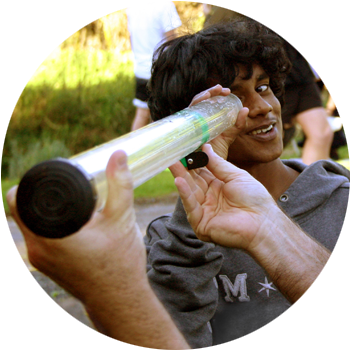 Students examine riparian areas, environmental & geographic factors that play a role in water quality. Along with turbidity (water clarity), temperature & tests on water volume movement are conducted. We cross check these with the oxygenation data to acess the health of the stream system. The most important measure of change is the presence of large numbers of different species. We highlight for students that there is an abundance of life all around them, the health of one species can depend on another & that if we follow natural processes we can restore degraded habitats. We complete multi species surveys, seek out predator / prey relationships & cross reference this measure with minimal sediment & high quality water to be confident of a healthy watershed. Using a quadrant survey, students identify the bio-diversity of an estuarine environment & the relationships between those species. They develop food chains & look for the gaps & imbalance in the overall food web. 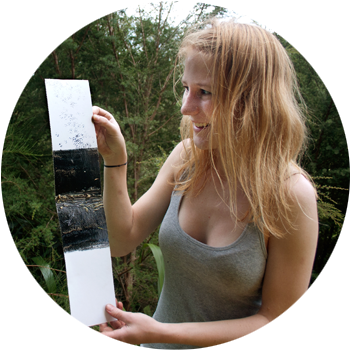 The New Zealand designed Trakka Tunnel system is a presence / absence fauna species identification survey, with the baited ink pads allowing species identifacation from footprints. Both native & predatory species are monitored.